Join Portland-based artists Harrell Fletcher, Molly Sherman and Nolan Calisch, collaborating under the name Public Doors and Windows (PDW), on February 12 and 13 for participatory walking tours of Collective Museum. On Friday, February 12, the day-long tour will encompass stops throughout the campus core. Whether at the site where Winnie Mandela spoke by pay phone to a group of students rallying in of support divestment from South Africa and the end of Apartheid or at the copse of trees next to the office of the lead mountain lion researcher, Chris Wilmers, where a mountain lion killed a deer, the stops along this day-long tour will provide a rare and personal glimpse of a campus that has had immeasurable impact on its community. On Saturday, February 13, the four-hour tour will concentrate on the Farm, Arboretum, and the Cowell Limeworks. With stops at the Amah Mutsun Relearning Garden, a worker's cabin in Cowell Limeworks, and at the mysterious mima mounds in the Great Meadow, this walk will offer a glimpse into the rich history of the campus. At each stop along the multi-day walk, staff, faculty, alumnus, or students will share the stories of the sites they've made part of Collective Museum. We will post location updates throughout both days here, so join us at anytime! The artists of Public Doors and Windows have worked with students, faculty, staff, and alumni to create Collective Museum out of the UC Santa Cruz campus – an experiential mobile website, public tour, and exhibition walls that allows audiences both within and beyond the campus to experience the diverse interests, people, research projects, archives, and histories encapsulated by the university. February 12: Meet at 9 am in front of the Digital Arts Research Center (DARC) to begin the tour. Parking ($4) is available in the Performing Arts Lot. February 13: Meet at 10 am in the Farm parking lot. Parking is available at meters or by permit ($4). Both days, we will supply light snacks and have water stations set up. BRING WATER BOTTLES AND BROWN BAG LUNCHES! These tours are FREE and open to the PUBLIC! Follow the tour on FACEBOOK, TWITTER, and INSTAGRAM. February 12, meet in front of the Digital Arts Research Center (DARC) at 9 am to begin the tour. 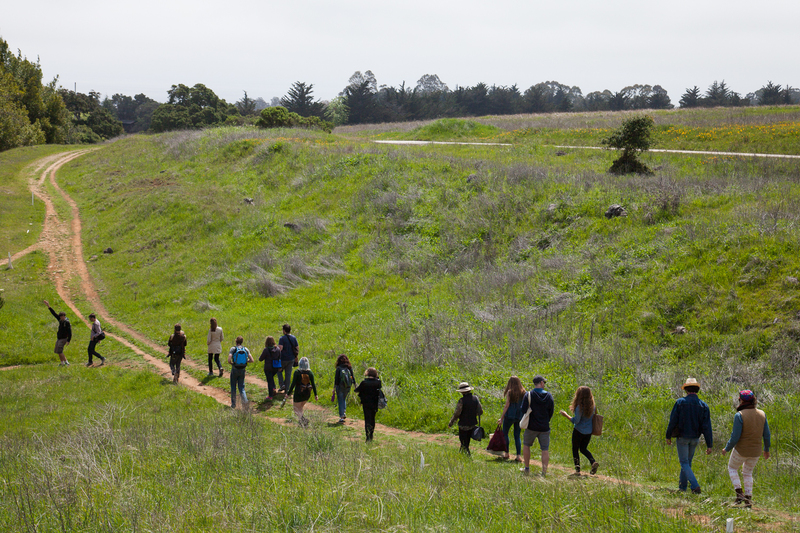 February 13, Meet at UCSC's Farm at 10 am.